Loose flowers from our Shabby Chic Collection are made of soft delicate pieces which will do much more than help you make a huge statement on your wedding day. They are the perfect way to decorate and add unique accents to your wedding decor! Each piece is made with careful attention to detail to ensure it matches precisely with your wedding theme and colors. Assorted loose flowers are available in several quantities including stemmed or unstemmed options. 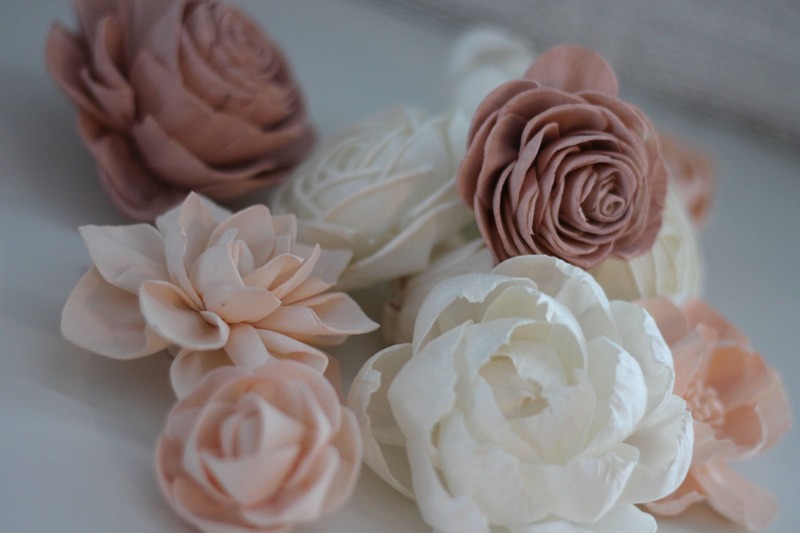 These flower styles will match your Shabby Chic Collection as well as the colors you have selected. Each flower is handmade and unique. 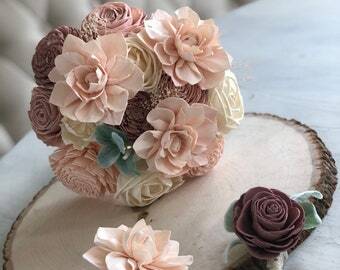 Our delicate flowers are not perfect and will have beautiful flaws including displaying wood grains, bark (or dark spots) and give your bouquet a rustic/shabby chic feel. Our delicate flowers are made from eco friendly materials including wood (sola, birch, cedar, pine), paper (book pages) and we accent using primarily preserved and dried naturals. Occasionally, we do use faux/artificial fillers or accents if the particular look we are trying to achieve isn't available through dried naturals or wood products. 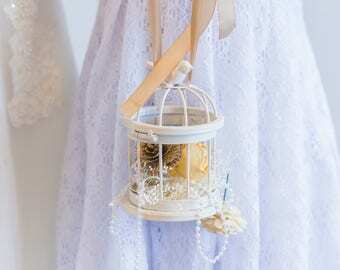 We use ribbons, jute twine and other materials to wrap our bouquets and accessories. If you have any questions on materials along the way, let us know! These beautiful flowers measure approximately 1.5"-3"
Our loose flowers are made to order and may take up to 8 weeks to ship to you. Please message us if you have questions about your order and its shipping time. Photos reflect similar boutonnieres, but yours will be created when you order. 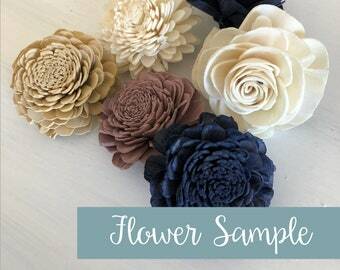 Your custom loose flower assortment will still include the same elements, colors and number of flowers. Want to see this assortment in different colors? Select "MULTIPLE COLORS" and add in the notes to seller during checkout the colors you would like to include in the assortment and we will make it happen. Need your order quicker? We have a rush option available for bouquets, boutonnieres, corsages and loose flowers at the links below. Each item in your order will need this option added for rush processing. This rush option will process your order in 3-5 business days and send them on their way. NOTE: Shipping time may vary, so we recommend selecting Priority EXPRESS Shipping with this option during checkout for quicker shipping times. As our flowers are made from organic, eco-friendly materials, please remove them from packaging immediately after receiving them and store them for your wedding date in a cool, dry location. Let any bouquets and preserved greens time to "fluff" back out as they have been traveling to you. Additional care instructions are included with your order. 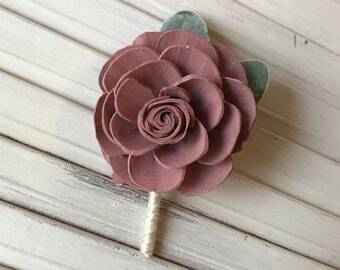 Please message Pine and Petal Weddings if you have questions or a custom project using these colors or this boutonnière style. We welcome any creative ideas you would like to see come to life! Sola flowers, Everyday Scented flower bouquet, Wooden flower bouquet, flower bouquet, forever bouquet, home decor, bridesmaid bouquet, toss bouquet, Wood Flowers, Sola Flower Bouquet, boutonnieres, moms flower, wedding flowers, succulents, faux succulents, succulent bouquet, wrist corsage, attendants flowers, flower girl alternatives, mother of the bride flowers, pin corsage, bulk sola flowers, loose sola flowers. Include a handwritten note and tissue wrapping for your flowers. Love these! Very communicative every step of the way and fast even with the limited time given for my wedding. Everyone thought they looked and smelled amazing. We can create any bouquet, accessory or item in your colors! Just add your request in the notes to seller and we will make it happen (and send pretty little pictures along the way). These flowers are each handmade and there will be imperfections such as chips from the edges of the plant or even bark within them naturally. We also work with natural materials such as book pages, comic books, birch wood, preserved foliages and flowers, and mulberry paper. Sometimes, if we are going for a particular look, we will use faux succulents, lambs ear, dusty miller or something similar. If you have a question about a material in your bouquet or arrangement specifically, feel free to ask! WHEN WILL MY ORDER SHIP? Custom Wedding Collections are typically processed within 6-8 weeks. If you have a special request or need a rush order, options are available within the shop. Please check your receipt for current processing times or send us a message if you would like an update! Custom Wedding Collections are typically processed within 6-8 weeks. If you have a special request or need a rush order, options are available within the shop. HOW DO I CARE FOR MY FLOWERS? Finally - flowers with no need to water them! Once your order arrives, allow your flowers to breathe for a couple days and they will dry out from the trip. Sometimes they are exposed to moisture during shipping (hot trucks, rain, etc) so its best to unpack them promptly as they are organic material and store them in a dry, cool, location. To keep the colors bright, your bouquets and decor should be kept out of direct sunlight. Flowers are subject to their environment as they are made from organic materials and may discolor or mold if they are exposed to moisture. Store wedding bouquets in a cool, dry place before the wedding to make sure bouquets are as vibrant as when they were received. WHAT SIZES ARE YOUR BOUQUETS? When shopping be sure to choose the right size - check and compare diameters of the bouquets you are shopping for to find the perfect "fit"! While any of these sizes will make your wedding day fantastic, many of our brides chose to select a Small or Medium Bouquet for their bridesmaids and Large or XL Bouquet for the bridal bouquet. **PRO TIP: Cut out a paper circle of the diameters and "try them on"
We abide by and follow Etsy's procedures and policies. During checkout you will be asked to confirm and verify your shipping address. Please make sure to double check and confirm exactly where you wish for it to go. If your address changes, please reach out to us immediately with the new address and wait for us to respond confirming the request. In certain cases, we are unable to make changes to the shipping address and in accordance with Etsy's regulations, we have to ship to the address provided to us. Once the label has been created, we are unable to make changes to the label as it will be in the process of shipping at that time.